The episodes since the mid-season premier have all been different in terms of structure. “After” focused on Rick, Carl, and Michonne. “Inmates” got us caught up with the rest of the group in small digestible chunks; episodes since then have been a mix of two formats. 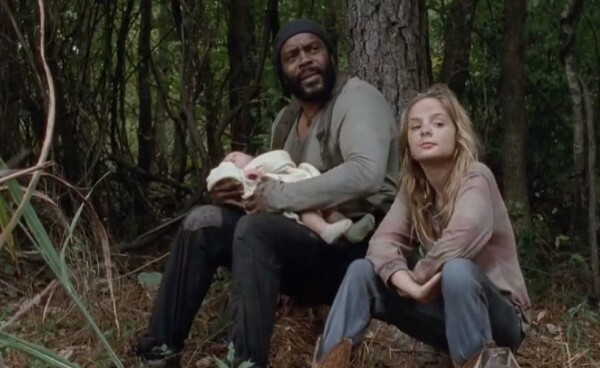 This episode centers on Carol, Tyrese, and the children. The group plays house, but don’t let their comfortable living situation fool you. Carol struggles to impart her wisdom to Mika and Lizzie, it’s about succeeding where she failed to protect her own daughter. Unfortunately the story ends with a similar tragedy. Lizzie murders Mika, in an attempt to prove her point that walkers aren’t all bad but misunderstood. Tyrese and Carol determine that Lizzie is too far gone. Carol puts her down Old Yeller style, which reminds her of the decision to kill both Karen and David, so she confesses to Tyrese. The confession sequence was done really it was tense, Carol at this point thinks of herself to be like Lizzie and offers Tyrese the choice to kill her. As he grabs the gun pieces of an unfinished puzzle are staged into the shot as we see the bigger picture. He chooses to forgive her, but chooses not to forget the incident. Tyrese’s story is all about the past. The memory of Karen literally haunts his dreams; he’s even convinced the living are doomed to be haunted by the dead. Coping with the loss of the prison, he suggests not going to Terminus at least right away since he trusts the group he’s with now versus having to trust people again. The big moment people will be talking about is the death of Mika and Lizzie. Despite the sisters being on polar opposite neither seems fit for survival. Mika doesn’t want their circumstances to change her into a mean person whereas Lizzie goes further off the deep. Believing that actually being a walker would allow her to adapt to this new world. Carol sees so much of Sophia in Mika, citing that both girls don’t have a mean bone in their body. Although that’s normally a great character trait to possess, in the zombie apocalypse it’s a liability. Lizzie shows promise, but also proves how disconnected from reality after referring to a walker as her best friend. In a final act to prove her point she murders Mika. The signs were there the whole time, and Carol herself says she should have seen it. Mika points out that the smoke they see would turn white if the fire stopped burning, which confirms the decision to put out the fire or in this case Lizzie. Carol sees the same deer Mika couldn’t kill shortly afterwards reinforcing the theme that everything worked out the way it should. It was interesting to see Carol process another tough decision since we don’t see that when she killed Karen and David. During the confrontation, Lizzie is more concerned about apologizing for pointing her gun at Carol than showing any remorse for what she did to Mika. I for one would be fascinated to hear Rick’s thoughts on this one if/when he finds out. Similar to Tyrese’s predicament The Grove won’t be forgotten any time soon, but it is a perfect example of what episodes should be like after the group got scattered. The episodes should focus on the core groups by doing so it elevates the emphasis on the separation while still taking it’s time with the aftermath of losing the prison. We’ll be back next week with the next episode of The Walking Dead “Us”. Tell us what you thought of the episode in the comments below. Judith came close to the chopping block, do you think she will make it past season five? Did you expect to lose both sisters in this bleak episode? Do you think Lizzie could have come back to her senses with more time? Who do you think started the fire (don’t say Billy Joel)? And don’t forget to check out the Walking Dead Board Game Kickstarter that we covered earlier! Laurence has previously written over at Whatculture.com.